Nova Covert Ops is a standalone mini expansion for StarCraft II that is being released in three installments. The first of these, Mission Pack 1, offers up four missions that will take most gamers somewhere between two to four hours to complete. The 'Nova' in 'Nova Covert Ops' is a Ghost - Ghosts are a popular Terran stealth specialist unit - who finds herself regaining consciousness in a strange lab without any memory of how she got there. I don't think that I'm really spoiling anything here by letting you know that she quickly determines that she is in danger and must break her way out of the lab. This leads directly into the first mission in which Nova must use her stealth powers to escape the facility in which the lab is located. It makes for some interesting gameplay, with the avoiding vision cones and cloak sensors and sniping guards at a distance kind of things, and while I found it enjoyable I can't really say it was all that challenging. Nova's special abilities make her fun to control and the lab facility breakout plays out more like a stealth action game than an RTS game. The multi-part opening mission then moves to a different style of play which is altogether new for StarCraft II, but that's something that I'll just let you discover for yourself. The remaining missions are a mix of base-building and stealth missions. 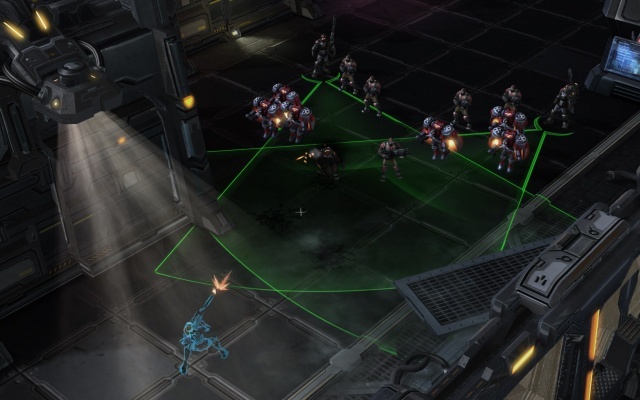 The base-building missions are designed to keep you focused on the objectives and don't give you access to the full Terran tech tree, which may make things a little easier for those who are using Nova Covert Ops as their introduction to StarCraft II, although the lack of the standard training/tutorial missions in this package may negate this noob advantage. Nova figures prominently in all of the missions as she serves as your hero unit, and you'll spend a good portion of the base missions controlling Nova and using the other units primarily to support her or to hold down hotspots until Nova can show up to put out the fire. The challenge in these missions is enough to keep you engaged, but not so much so that anyone who has made their way through StarCraft II will have too much trouble with them. There were missions in the other StarCraft II expansions that I epically failed deep into the battle and had to replay from the start taking a different strategic approach, but Nova Covert Ops never worked me into a corner. There are some intriguing options between the missions in Nova Cover Ops. For one, you can select Nova's loadout for the battle, perhaps opting for a jump pack and a shotgun over her standard stealth suit and sniper rifle. You can also redistribute some of the special abilities between unit types - why should Marines hog all of the stimpacks? They're intriguing, but also underutilized, but I hope that's more of a consequence of the game essentially ending only a third of the way into the campaign than anything else. As it stands in Mission Pack 1 these options have little real impact on mission outcomes. Even though Nova Covert Ops is not an expansion on par with the size of Heart of the Swarm or Legacy of the Void, the game still features full cutscenes and pre-mission briefings. The story features a Zerg resurgence against Terran worlds, which leads to a factional split with different ideas of how to meet the new threat. It's an interesting enough set-up, but it doesn't have the chance to really get going due to the brevity of the mission pack. It doesn't really end on a cliffhanger or dramatic high note either, leaving Mission Pack 2 to begin with what will probably be more of a 'here's where we left off' note than a bang. It's hard to judge the overall quality of an expansion just a third of the way in, but Mission Pack 1 is a good enough of a start to make me look forward to the next installment. I'd like to see the loadout options have more of an impact on the gameplay in future missions, the difficulty ramp up, and the story to kick it up a notch in Mission Pack 2, though.